Imagine that you are a dinosaur. No, seriously, imagine that you are a dinosaur. Start with Velociraptor, the sickle claw killer of Jurassic Park. Replace the sickle and claws with a three-toed foot. Turn one finger around to make an opposing thumb, so you can grip tools. Make the brain bigger and the snout shorter. Optionally: remove the tail. Add feathers, at least on the places of your body, where you have hair. Voilà, you have a dino-humanoid. Dino Sapiens. Far fetched? Sci-fi-fantasy? Not at all. This is how we humans probably would have looked like, if not the big meteorite had hit right in the wrong place 66 million years ago. Everyone knows that the big meteorite killed the dinosaurs. If you are not familiar with it, ask the nearest six-year-old. But what if the meteorite had not hit us? Or had hit just a few minutes earlier or later. As the six-year-old can tell you, the dinosaurs died out because a meteorite, around ten kilometers across, hit the Yucatan peninsula in Mexico. The heat created ravaging forest fires, and the impact sent dust into the air, cooled the climate for possibly several years. Then, the climate drove into the other ditch. The Yucatan peninsula is mainly limestone, carbonate rock, and the impact heat turned limestone into CO2, creating a sudden, strong greenhouse effect, which squeezed life on Earth for decades – and squeezed much of it out. But, what if the meteorite had not hit us? Then, the dinosaurs would probably still be wandering happily around, and mammals would still be no larger than a small dog, hiding in the bushes and venturing out at night, trying to not become dino food. Even if the meteorite had hit just a few minutes earlier or later, things might have been different. Then, it would have hit the Pacific or Atlantic Ocean and created the mother of all tsunamis, and devastated the coasts all around the ocean. Dust and heat wave would follow – but there would be no limestone to create the rapid greenhouse effect. The dinosaurs would get a blow, but those far from coasts could have made it through. The Earth 66 million years ago, quite familiar, but with high sea level, oceans floating onto the continents. Note the open passage between North and South America. The Yucatan impact site is the black dot in Mexico. From Dinosaurpictures.org, based on maps from Christoper Scotese. The meteorite hit right in the worst place, truly a bad luck for the dinosaurs, but good for us. The dinosaurs themselves were also result of a catastrophe. Hard to imagine, but it was even worse, and it came from inside. It was a super-volcano that would make the worst case in Yellowstone a small fart. 252 million years ago, for thousands of years in a row, what is now the middle of nowhere in Siberia was the place of ultra-volcanoes. They spewed out ash and lava flows, which are 2,5 million km2 wide and that is today, after millions of years of erosion. Originally, the Siberian traps may have been seven million km2 wide – around ten times the area of Texas! The volume was at least 2,5 million km3, may be as much as four million. The Siberian Traps volcanites cover large parts of Siberia. The blue line shows the outline, with exposed lavas in purple and tuffs and ash in red. (By Kaidor [CC BY-SA 3.0 (https://creativecommons.org/licenses/by-sa/3.0)], from Wikimedia Commons). On its way up, the magma plowed through limestone and coal. The heated limestone released CO2, but even worse, the heating made the coal release lots of methane. Methane is a 25 times more powerful greenhouse gas than CO2. The Earth turned into a sauna. Temperature in the oceans spiked, to 40 C at the surface in the tropics, ten degrees more than before, and also ten degrees higher than today. We do not know exactly how the high temperature led to the extinction, but one way is that it halted photosynthesis. Above ca 35 C, photosynthesis stops, and the result was that the base of the food chain collapsed in low latitudes. When the base collapsed, all animals above followed. The increased temperature probably also halted ocean circulation, and save for the upper layers of water, the seas became anoxic – without oxygen. Most of the life in the seas simply suffocated. On top of it all, the increased CO2 made oceans more acidic – which in turn halted shell development in all the organisms with carbonate shells. Life was thus squeezed, from the deep to the shallow part of the oceans, and onto the higher latitudes, where ocean temperature was colder. The higher temperatures impacted land as well. At the time, Pangaea was complete, and much of the big continent was a big desert, with vegetation concentrated around the rim. There is almost no coal from the Early Triassic, and it may be because the higher temperature killed vegetation. No vegetation, no food for veggie eaters, and no veggies for the meat eaters. The Earth around 250 million years ago, with all land mass assebled in one big continent. Siberia, with the Siberian Traps is near the top of the Earth. The thin white line is Equator. From Dinosaurpictures.org, based on maps from Christoper Scotese. But some made it through, among them some reptiles known as archosauria, the ancestors of crocodiles and of dinosaurs. Through the next 50 million years, the Triassic was the research&development phase of the dinosaurs. Then, after < href=https://www.britannica.com/science/end-Triassic-extinction>another extinction, driven by volcanism that started the opening of the Atlantic Ocean, the competition was pushed aside, and the dinosaurs roamed Jurassic&Cretaceous park for 135 million years. If the Siberian Traps had not happened, dinosaurs would not have happened. And they became as bad as they did, because an enormous mantle plume happened to hit the bottom of a continent just where there was limestone and coal to heat. How would we have looked, if the Siberian Traps had not happened either? If neither dinosaurs nor true mammals ever evolved? Judging from the look of the reptile animals, which dominate the Permian, only one answer is quite certain: We would have been ugly. The first reptiles evolved from amphibians in the late Carboniferous, around 320 million years ago, by developing eggs with calcite shells, which could stay out of water. The first reptiles looked basically like lizards do today, a kind of original reptile-mold shape. But from there, they evolved into many directions, a true bizarr-o-rama. The biology and heritage lines are quite complicated, with classification largely based on the number of holes in the skulls. There were the pareiasaurs, which looked like a reptile with a frog body and the legs in reversed order, and a head with more knobs than a cantina visitor in Star Wars. Anteosaurs, kind of like reptile bulldogs. 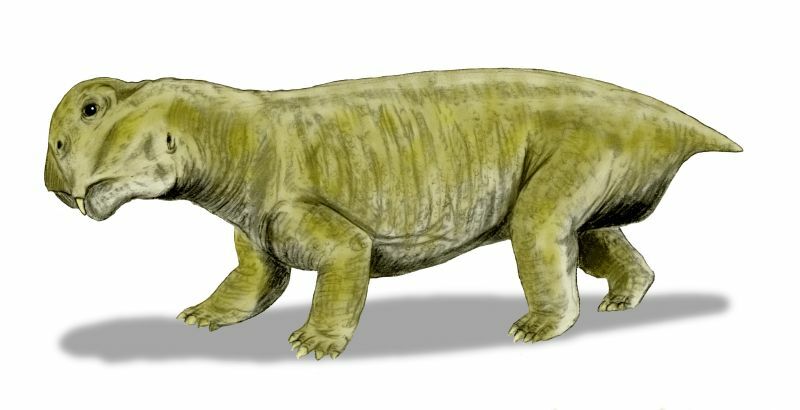 Dicynodonts, which looked like crossings of hippos, rhinos and pigs. And Lystrosaurus, the reptile with a mole face. Lystrosaurs, anteosaurs and dicynodonts are interesting, because they all belong to the synapsids, the reptiles with one hole in their skull. These are our ancestors, and through the Permian, they pulled their legs in under the body, changing from the reptile crawling towards the much more efficient gait of mammals. There are even fossils, which suggest that at least some synapsids developed hairs – primitive fur – and that they were endothermic, a.k.a. could produce some of their own body heat. May be, if evolution had not been interrupted by the big, end Permian catastrophe, some of these would have developed not into the mammals they actually, eventually became, but to something…ugly, mammal-like, but which still laid eggs? Ugly Sapiens. And so, we could go further backward in time, through the mass extinctions, each of which half-reset life and allowed evolution to take a new course. But, for the next episode, we will instead look at how geological events, outside of the extinctions, also lined up to steer evolution on its course. Many geological events had to take place to make Earth a place for humans to live. Stay tuned! This post is partly based on the books When Life Nearly Died by Michael J. Benton and A New History of Life: The Radical New Discoveries about the Origins and Evolution of Life on Earth by Peter Ward and Joe Kirschvink.